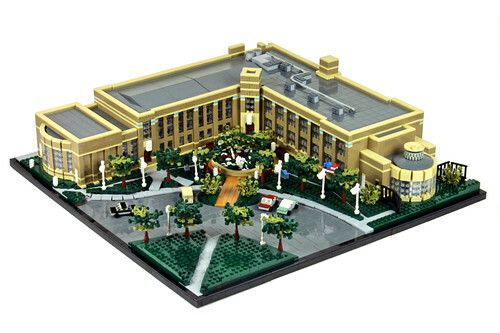 Brick Town Talk: Microscale Monday 01-21-2013 - LEGO Town, Architecture, Building Tips, Inspiration Ideas, and more! Charlevoix, Michigan - (BTT) Currently housed in a historic 1927 building, originally designed as a middle school, the Charlevoix Public Library proves that the need for books still is strong, and having a place to put them is as important as ever. Not to take anything away from the Kindle and iPad faithful, but there is something to be said for having a real book with real paper in your hands (paper cuts notwithstanding).